Survive the Pass & Defeat the Endless to Earn Glory in Endless Pass – Available Now! 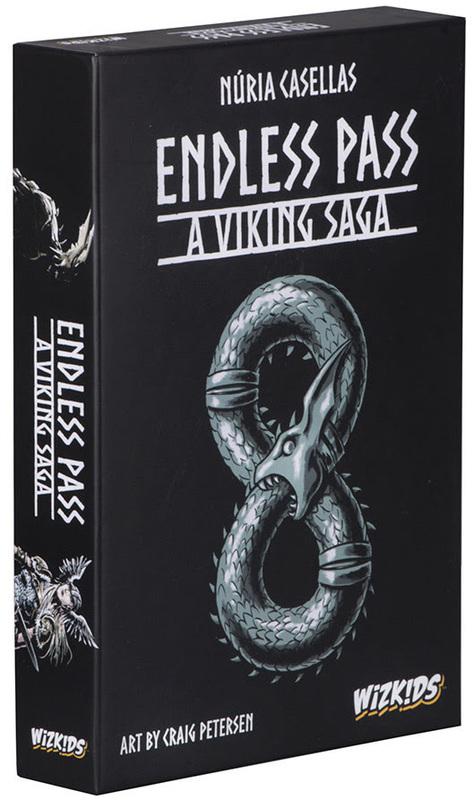 Hillside, NJ – April 11, 2018 – WizKids is excited to announce the release of their newest card-based adventure game, Endless Pass. 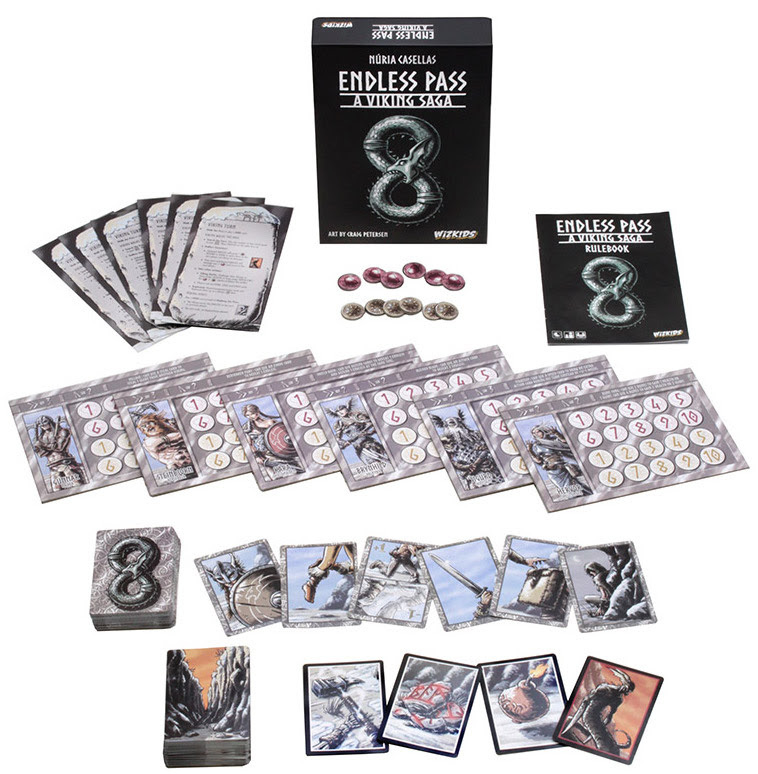 Designed by Nuria Casellas, two to six players take on the role of a Viking and explore the Pass while not only fighting the never-ending hoard of Endless, but rival Vikings as well. What are they fighting for? Eternal Glory! The goal is simple: the last Viking standing or the first to earn 10 Glory, while surviving the turn, wins. If none of the players survive, then the player with the highest amount of Glory will take the honor of most worthy within Valhalla. To earn Glory, a Viking can either slay Endless as they appear in front of him or her or take it from another Viking in a surprise attack! Each of the player boards are double sided. One side showing a generic Viking, all with the same stats, while the other is a named Viking Hero, such as Gunnar the Raider or Brynhild the Valkyrie, each with their own abilities. No matter what, each player has 10 health and needs 10 Glory. Start each round by drawing cards from The Pass deck. Here is where the Endless show up, reptilian monstrosities spawned from Jormungand, the Midgard Serpent. Using additional cards from the Action deck, a Viking can use a sword or Greek Fire to kill Endless, earning Glory. Or they can play a defensive game, blocking Endless with shields or dodging out of the way. If an Endless isn’t defeated by the end of a player’s turn, all of them get passed onto the next player! A Viking could end up being overwhelmed in a sea of ferocious Endless! Vikings needn’t only attack Endless – they can attack another Viking! Swing a sword or throw a bomb at another player in an attempt to take a Glory, or even health, from them. Be cautious, a good Viking won’t go down without a fight and can be ready to defend or dodge incoming attacks at a moment’s notice. Will you be the Conqueror of The Pass? Are you worthy of receiving everlasting glory in the realm of Valhalla? Pick up Endless Pass at your Friendly Local Game Store for $24.99 and find out! Fans of Power Episode 53 - Larry Houston!